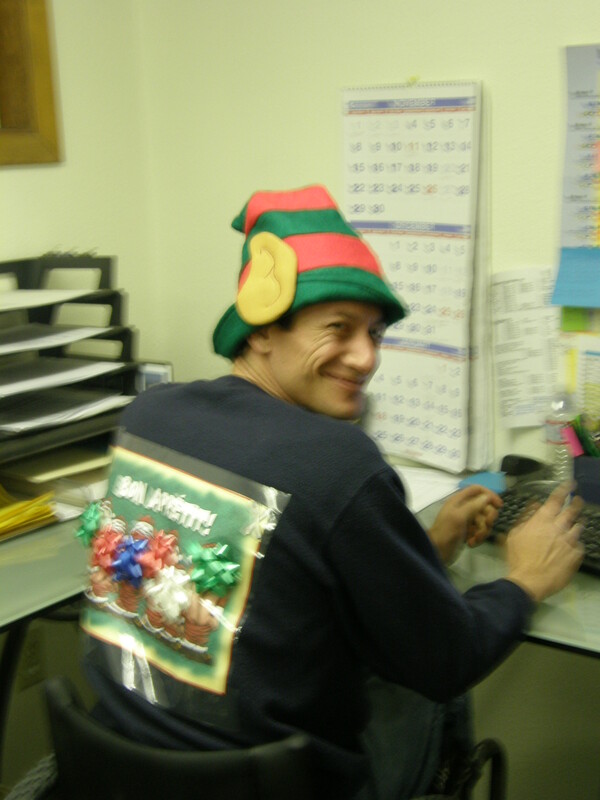 Holiday Time At Gold Dust! We hope you had a Merry Christmas . . .
There’s a little snow left on the ground and the steady hum of a packing shed on the outskirts of Malin. Yes, it’s definitely shipping season. 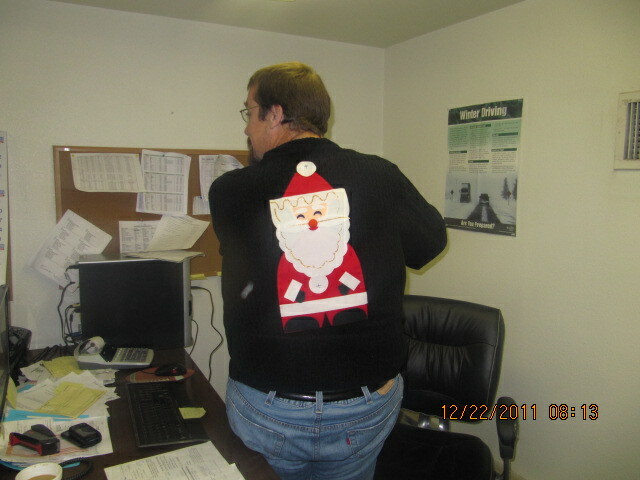 It’s also the holiday season at Gold Dust and Walker Brothers! Tricia followed Bill by discussing the partners’ efforts to change their methods of communicating and their desire to foster a more a positive environment throughout the entire company, which would require help from everyone at the dinner. Weston also took this opportunity to discuss what the future is looking like for the farm and the impact of having visitors from all over the globe. Once dinner was served and finished, Weston, Tricia and Bill recognized three employees who have went above and beyond in their jobs. Trino Zendejas Rodriguez, who has been promoted to manager at the Running Y, was called “The Man Who Has Got It”, by Weston. Since taking over as manager, Trino has stepped up and ran the ranch as if it were his own, meeting and exceeding the expectations of all the partners. Next to receive recognition for her hard work and ability to step up was Sarah Mendez. After receiving her blinged-out award, Tricia explained to the guests that Sarah has stepped into a new position, requiring her take on a huge amount of ownership for the analysis and book-work in the office. The final employee recognized for his dedication was Felimon Martinez Acosta. As Bill put it, “nobody hardly knows what he’s doing, but for the past three years he’s kept the packing shed running, taught himself welding and about machinery and how to keep things going.” Felimon’s dedication has saved the company a lot of money by the maintenance program he’s implemented and has kept the shed from having to be closed down. After the awards were handed out, Weston wrapped up the dinner by thanking each employee and telling the guests a little bit about each person. Who keeps the shed going? Felimon does! The following Wednesday (December 18th), everyone at the shed was treated to lunch served by Tacos Ala Mexicana from Merrill. While the crews dined on chicken, beef and pork tacos, the partners stood up and thanked everyone for another year of hard work and dedication. The shed is getting close to a year without a serious injury, to which Bill and John offered a bonus if the shed crew could make it an entire year. They also praised the crews for staying with them and helping make Gold Dust and Walker Brothers not only successful, but also a good place to work with its own culture. Before the lunch was over, everyone had a slice of Christmas cake and mingled until it was time to put the tables and chairs away. Merry Christmas, Gold Dust and Walker Brothers Crews! John and Bill talk about the greatest packing shed and farm crews in the Basin – ours! Is it time for cake? Mark, you’d make a great double for the Big Man In Red! I imagine you get tired of hearing that. And if that wasn’t enough Christmas-time celebrating, the Gold Dust office crew had a lunch-time Christmas party of their own on the 19th! 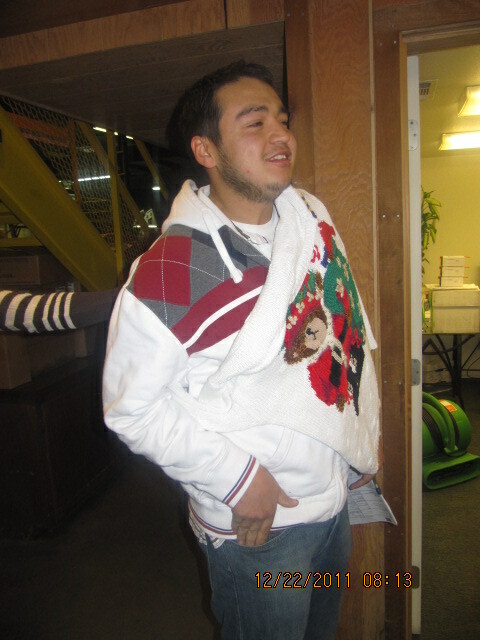 As with every year, they held a Secret Santa gift exchange along with an ugly sweater contest. Again, Necia took home first prize for her, erm, “stylish” take on appropriate Christmas wear with Tricia coming in second. Everybody got a present? Then shred some paper! Yutaka looks pleased with his Secret Santa gift! 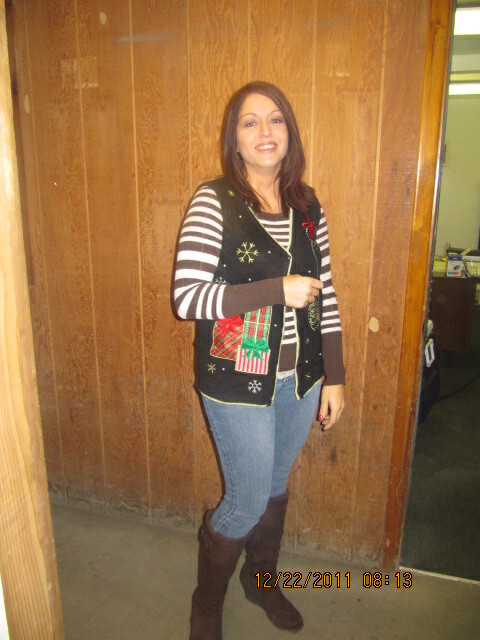 Yep, Necia’s Christmas “outfit” is pretty hideous – er, I mean, charming! While ugly sweaters and lunch-time gatherings are fun, it’s also a time of year when we get to reflect on how to best help others. This year, Gold Dust and Walker Brothers decided to donate a load of potatoes to the Southern Oregon Outreach Foundation (SOOF). 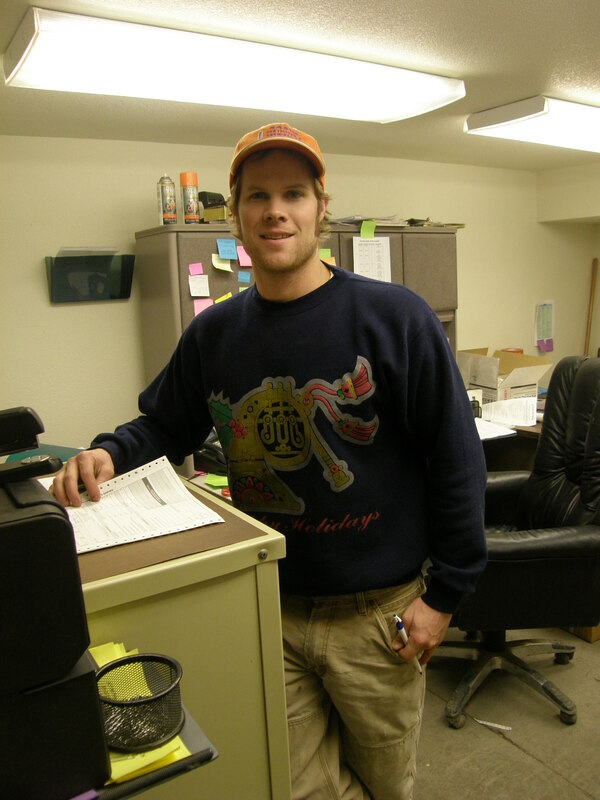 For over a year now, we’ve been hauling goods at a discounted rate to help SOOF with their mission of helping local food banks and other outreach organizations all over Southern Oregon, including Klamath County. With all the good that SOOF quietly does, we’re glad to help them out and hope others will too. Before we wrap up this post, Bill, John, Tricia and Weston hope all of our employees had a wonderful Christmas with their families. The long hours our crews put in along with the dedication to their jobs and the great attitudes they bring with them help make Gold Dust and Walker Brothers successful. Thank you. And to our business partners, vendors and customers, thank you for making 2013 great! Here’s to a successful 2014!
. . . and here’s to a Happy New Year! Cheers! Happy Holidays From Gold Dust! Snow is on the ground and cheer is in the air. 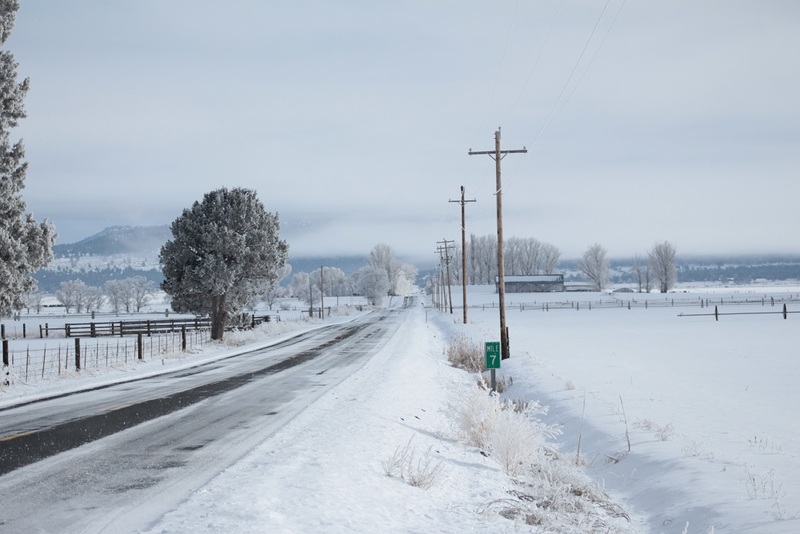 It looks quite a bit like Christmas around the Klamath Basin. 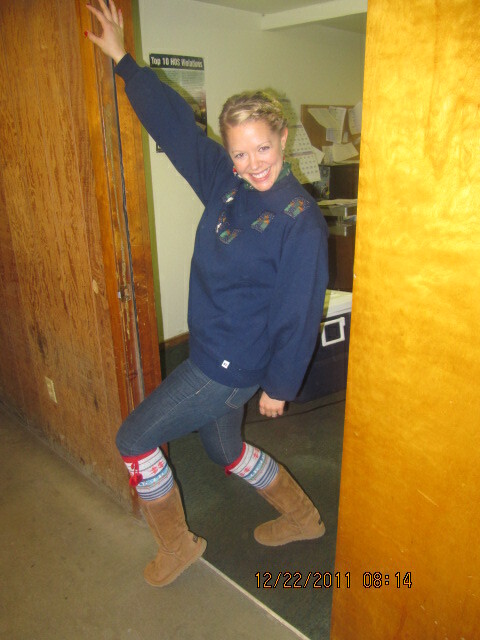 The holiday spirit is alive and well at Gold Dust! 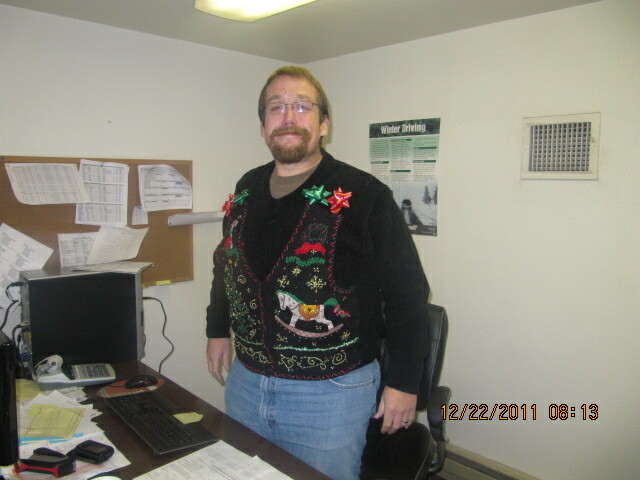 Last Thursday (December 20th), if you visited the offices at the shed you may have noticed some of the office staff were dressed in “festive” (the word being a euphemism) sweaters. 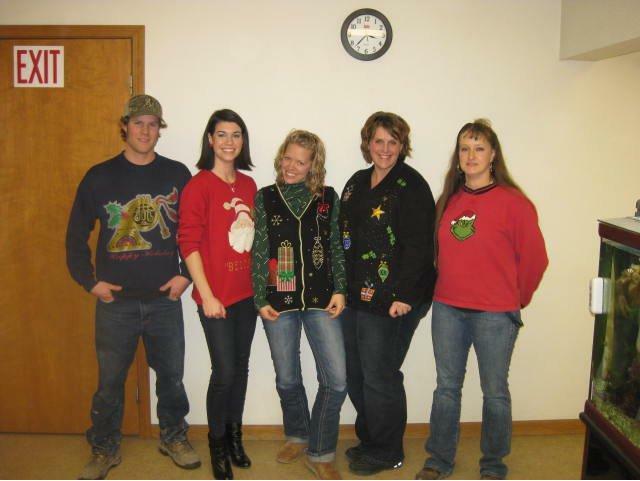 Since these folks usually are sharper dressers than what the photos show, you can surmise it was the annual ugly Christmas sweater contest. This year, there was a tie (who knew there could be two sweaters that terrible, right?) between Laura and Necia. If you thought those were nice enough to wear to your Christmas dinner, you may want to fire your stylist. 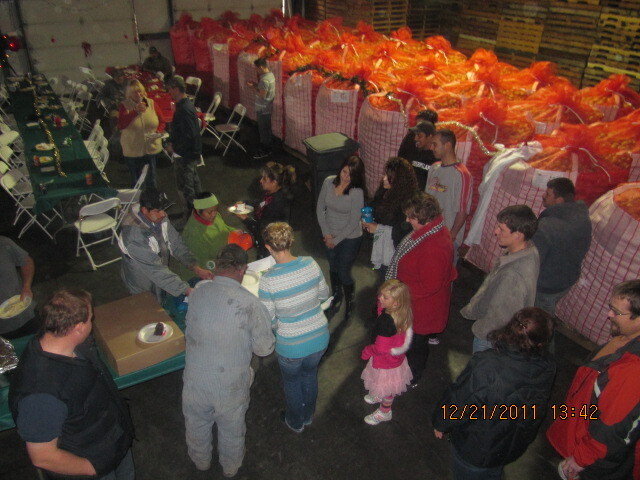 The next day, Tacos Ala Mexicana were brought in for Christmas lunch for the shop, shed and office crews. Tables were set up on the shed floor while Gold Dust’s employees visited and lunched on enchiladas, tacos, rice and beans. 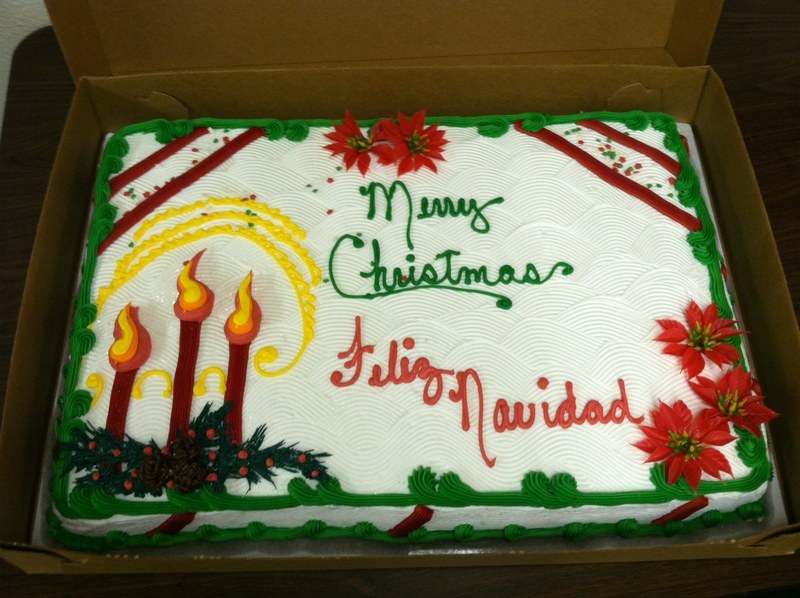 After the cake was cut and served, on behalf of the partners, Weston thanked everyone for their continued hard work and dedication before wishing a Merry Christmas to all. 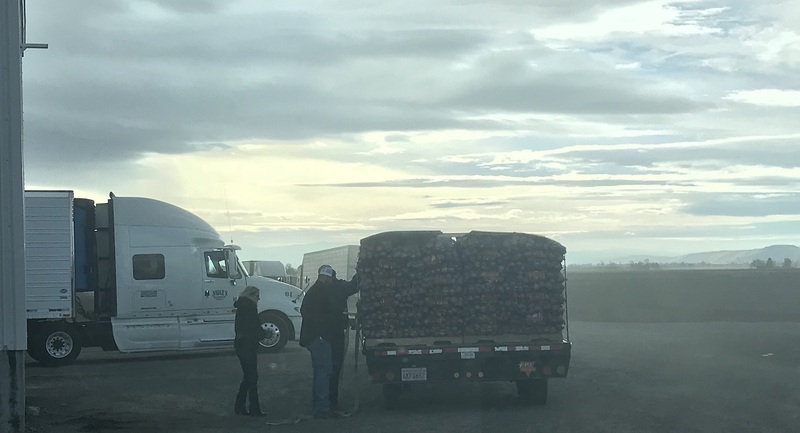 As you read in our last blog post “Gold Dust Hits The Road For Food Bank and SOOF“, Gold Dust donated 40,000 pounds of potatoes to Southern Oregon Outreach Foundation and the Klamath Lake Counties Food Bank. 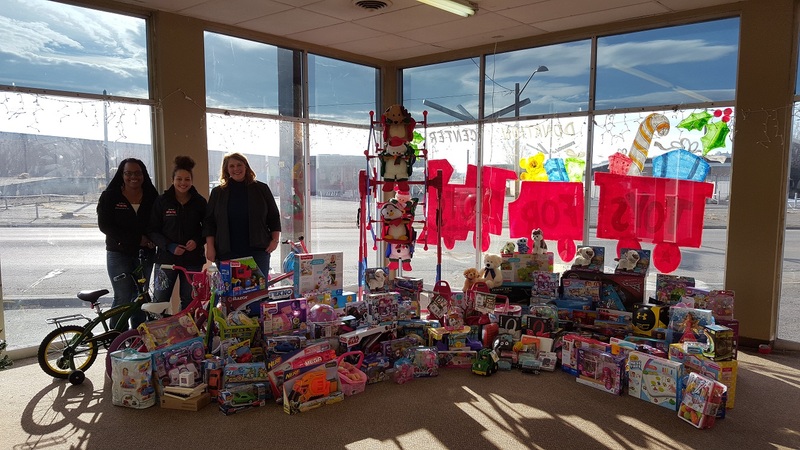 Also in the blog post, you may have noticed the employees were raising money for Toys For Tots and the food bank. How much was raised? The employees pooled together $300, which was matched by Gold Dust’s partners to bring the total to $600 to be split evenly between the two organizations. Well done! Before wrapping up this post (unintentional Christmas pun! 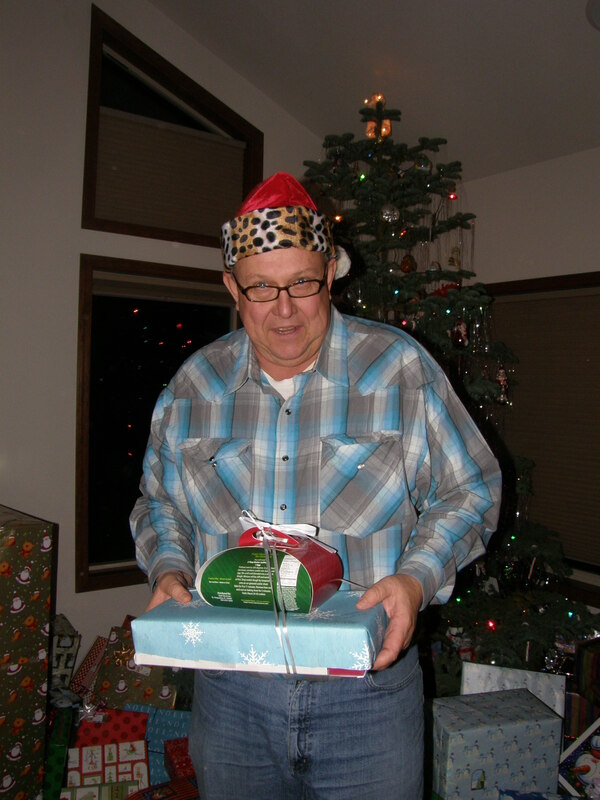 ), on behalf of Bill, John, Weston and Tricia, we hope you had a Merry Christmas and wish you a Happy New Year. And to our employees, who work in the shed, the fields, the shop and in our offices, again, thank you for everything you do to make Gold Dust and Walker Brothers successful. 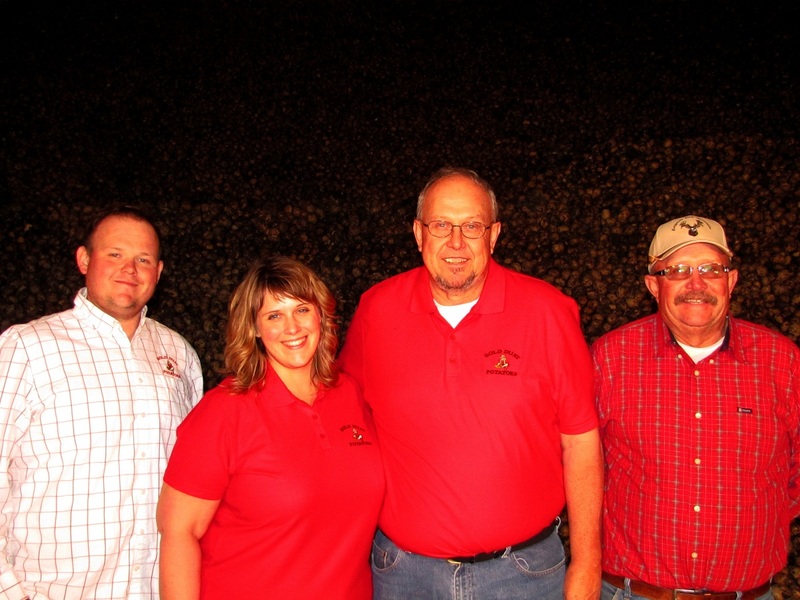 Without our hardworking crews, we couldn’t be the best farm and processing plant in the Basin. Thank you. Here’s to a bright 2013! Keep reaching for the stars, Necia! And yes, she stood like that all day. I think we have a possible Santa sighting! Everybody – look innocent! 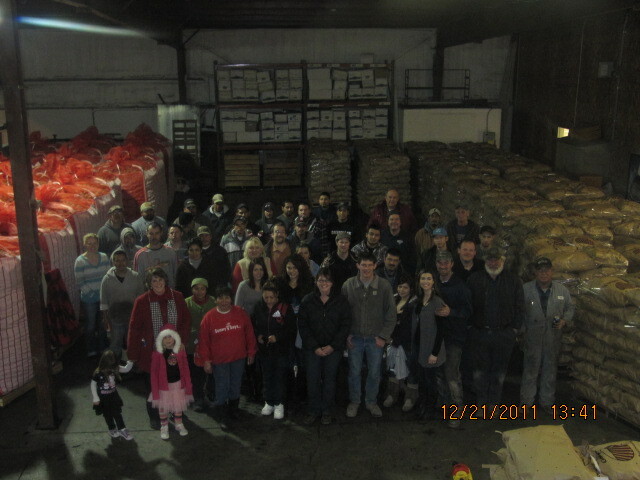 From our crew to yours - Here's To A Fantastic 2012! Though Christmas and New Year’s have come and gone, that doesn’t mean the crew at Gold Dust Potatoes and Walker Brothers farm didn’t take a little time out of our busy shipping schedule to celebrate the holidays. Well, at least Christmas! New Years was unusually busy but our dedicated processing and shipping crews worked through the day to meet our customers’ needs. As we do every year for the holiday party, we took an extra long lunch with all of our staff and crew to enjoy a feast put together by Merrill’s very own Tacos Ala Mexicana. This year there were fixings for tacos and enchiladas as well as a new spicy beef recipe they’re working on (it’s great, by the way). After all had a chance to eat, Bill thanked everyone for their hard work and asked that everybody put safety in the front of their minds for this busy shipping season. When Bill finished, Necia announced that under a few lucky seats were Fred Meyers gift cards and numbers for several winners to pick items from the prize pile. Once prizes were selected, everybody who was at the lunch gathered for a company photo and the luncheon finished with cake (it’s not a party without cake!). 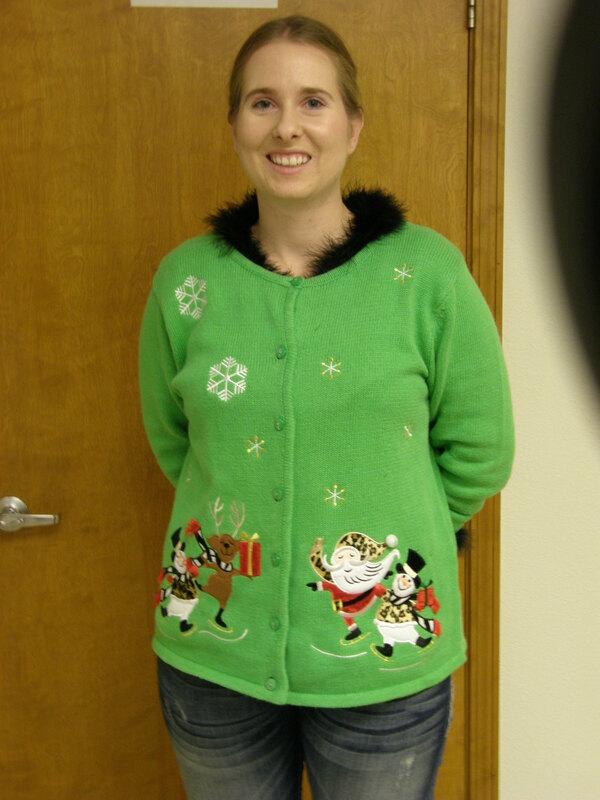 Later that week, the office staff held their annual Christmas sweater contest (the desk decorating contest was skipped since Tricia has won it every year!). And with a look at the pictures, it’s easy to see why Rich took first and Lexi a close second! While we always enjoy the company holiday lunch and other festivities, this year our employees did something we feel deserves extra recognition. After Thanksgiving, Necia suggested Gold Dust adopt a family for the Christmas season. 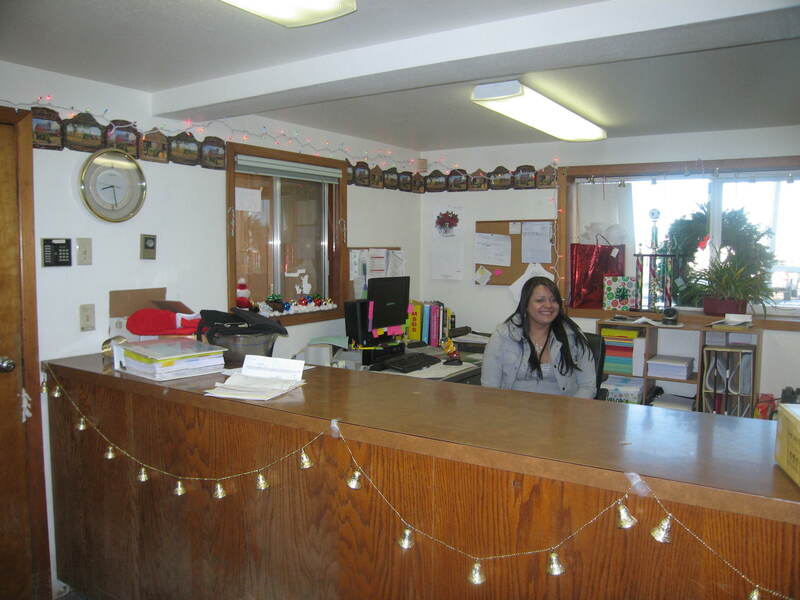 Both the office staff and management thought it was an awesome idea, so Necia reached out to Klamath Lake Community Action Partnership, who sponsors the Adopt-A-Family program for Klamath and Lake counties. They assigned us a family and we put a big jar at the front desk so everyone that works for Gold Dust and Walker Brothers could help out. And in the spirit of that giving, Gold Dust said they’d match the amount raised by the employees. In the weeks before Christmas, Gold Dust and Walker Brothers’ generous employees raised a few hundred dollars. There weren’t just nickels and dimes in the jar – folks were giving dollar bills and more as well. With Gold Dust matching that money, it meant the total amount raised for our adopted family was enough to give the family a nice Christmas. 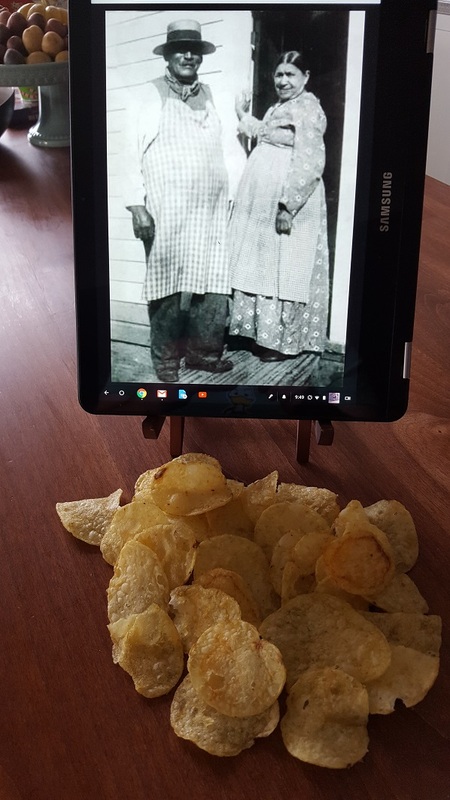 Everybody was proud and happy. However, this story doesn’t end there. When Dan Pappy, one of Gold Dust and Walker Brothers’ long time employees, learned of the adopt a family program, he told Necia to tell him what the final total was of the employee donations and he’d “round it up”. Round it up he did – including the contribution from Gold Dust, the total allotted to spend on the family adopted by our employees was $1,000. That was much more than we thought we had! 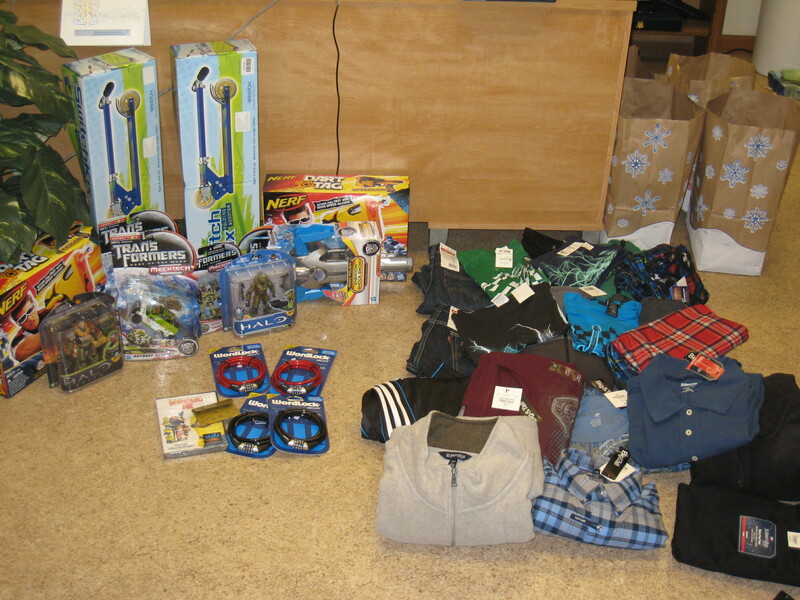 The money was spent on a gift card for groceries, clothing, toys and other presents. 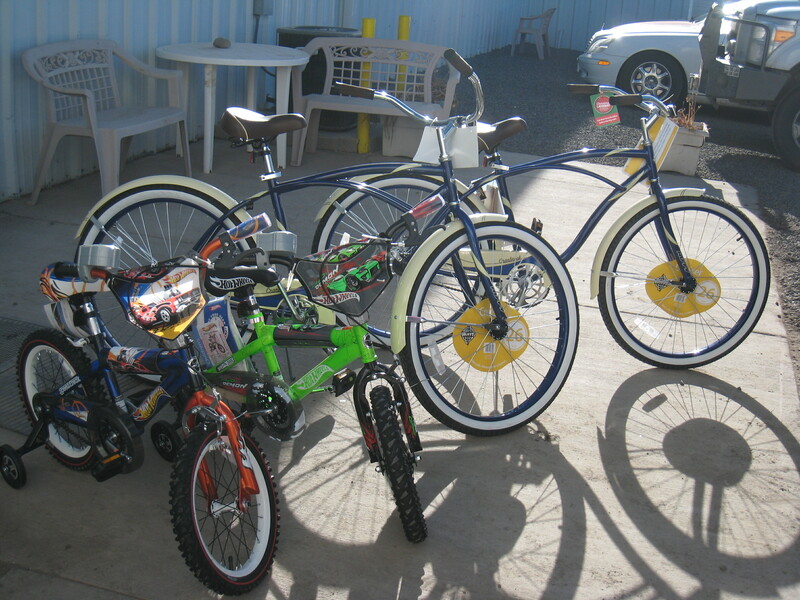 And because of Dan’s generosity, we were even able to buy bicycles for the family of four. We later heard the father of the family had recently gotten a job that required him to change buses several times before getting to his place of employment. The gift of a bicycle now meant he didn’t have to ride the bus and could save time and money. That news only added to the warm fuzzies we got from giving. 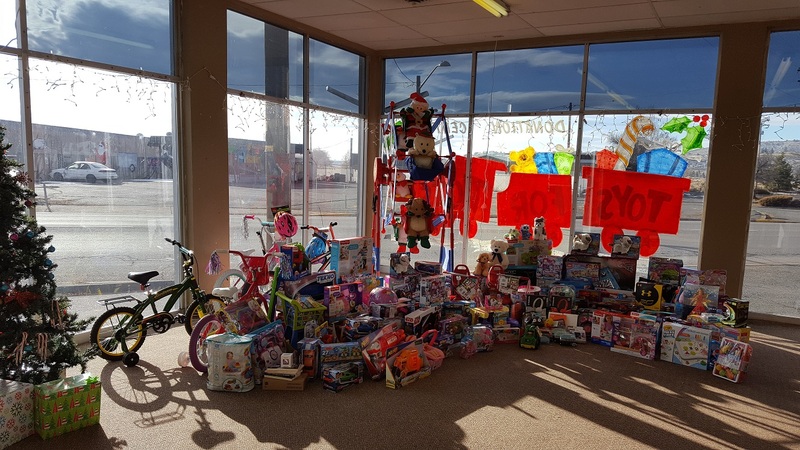 We have a wonderful, generous crew here, and we’re proud of our employees for raising so much money to help a family they don’t even know. During a time when our employees are working long hours away from their families, they still pitched in to help others in need. Thanks to these people, you can see the spirit of compassion and giving are alive and well in our packing shed and around our farm. Bill, John, Tricia and Weston hope everybody had a wonderful holiday season. We would like to thank our customers for their continued support and wish them a successful 2012. And to our employees, thank you for the long hours you’re putting in and your continued dedication to making Gold Dust and Walker Brothers farm a success. Here’s to a safe and prosperous 2012! Mmmmm, tacos and enchiladas. Need we say more? Weston announces to the crowd if they don’t get in the company photo, they don’t get cake! 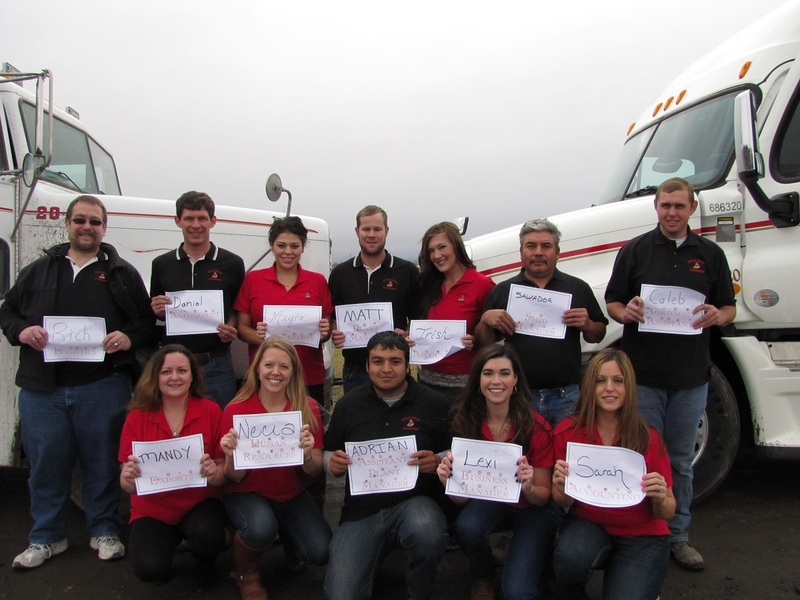 From our crew to yours – Here’s To A Fantastic 2012! Now it’s time for cake! Now that is pretty, erm, “Christmas-y” . . . but the “Christmas-iest”? Okay, yeah, it’s terrible coming and going! I believe that is technically wearing a Christmas sweater. Kinda’ looks like a toga . . . .
Our generous employees raised enough money to purchase all of this and then some. Well done. And thank to Dan’s additional generosity, this is a family on wheels! 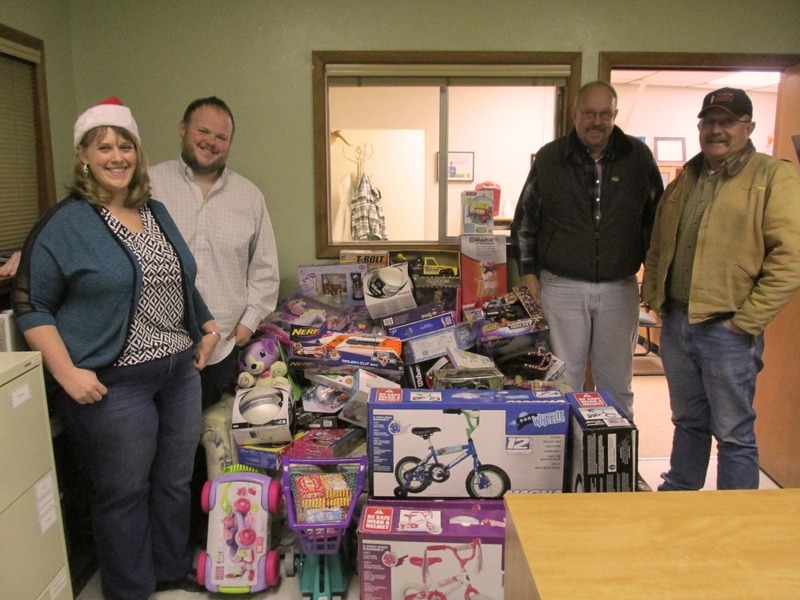 Before we wrap this post up, if you would like to learn more about Klamath Lake County Action Partnership and their Adopt-A-Family program, please visit their website and get in touch with them. There you will find information about this wonderful organization and the services and resources they provide for families in need. You can also donate to them via PayPal or visit their donation page to see which materials local families need the most. Season’s Greetings From Gold Dust! While shipping season is one of the busiest times of year at our potato packing plant, we still managed to take a little time to enjoy the Christmas season around the offices and on the production floor. Our main hallway was decorated with cards from customers and businesses we work with, wreaths were hung on doors and desks were decorated with tinsel, ornaments and wrapping paper. 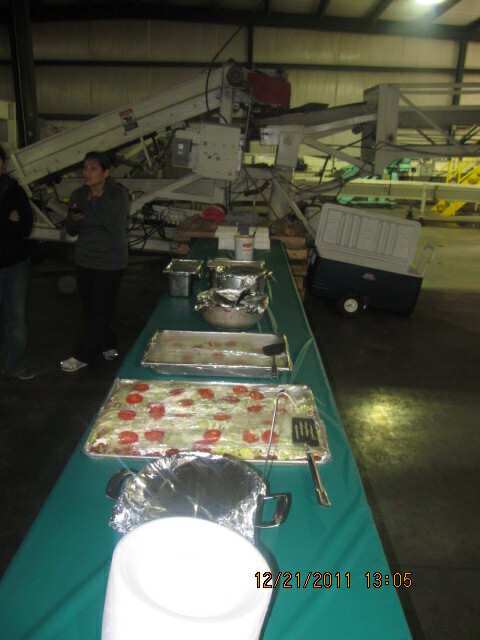 For a processing plant, it looked a bit like Santa’s workshop! 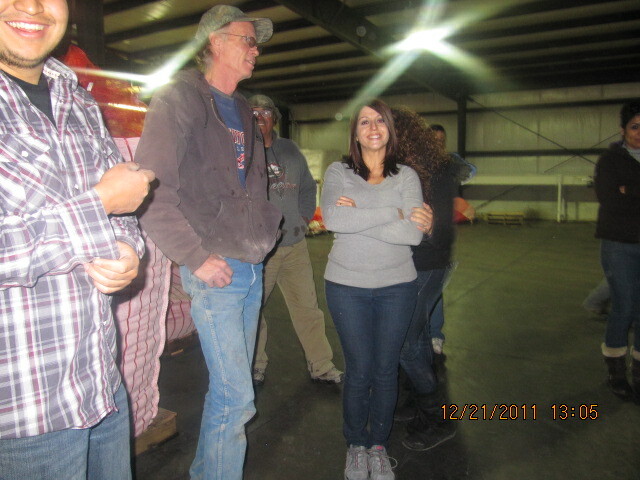 On Wednesday, December 22nd, the floor crew and office staff were treated to lunch at the shed. Everyone enjoyed tacos and enchiladas from Merrill’s Tacos ala Mexicanas while Bill and John handed out Christmas bonuses and gift cards in appreciation of everyone’s hard work. Though the setting wasn’t glamorous, all you need for a good time are good people and good food. 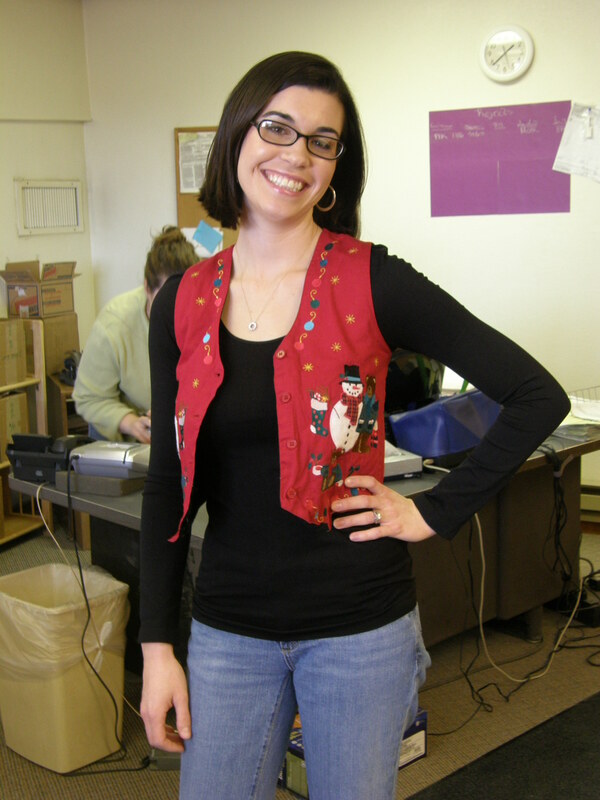 The next day, December 23rd, the office staff had an ugly Christmas sweater contest and judging for the best decorated desk contest were held. 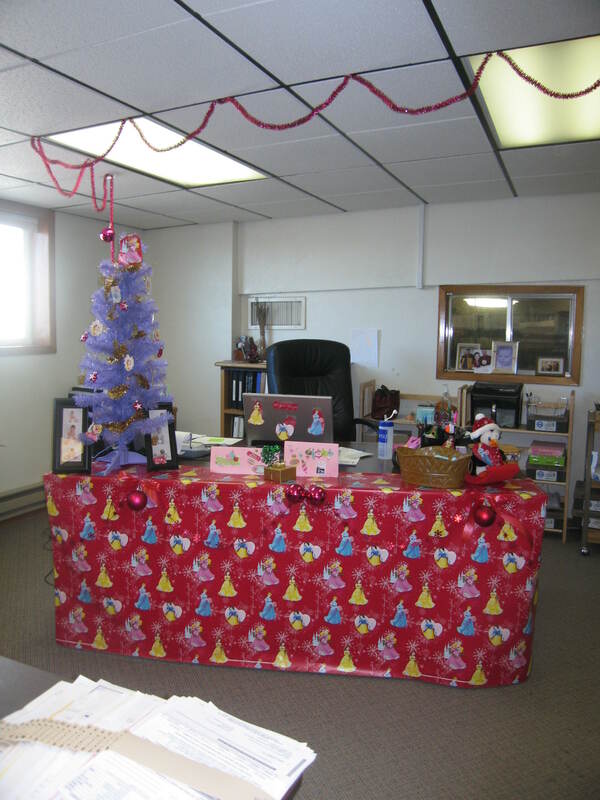 While the competition was tight for the desk decorating contest, Tricia won first place, though she did get a little help from her own Christmas elves Rory and Mari. 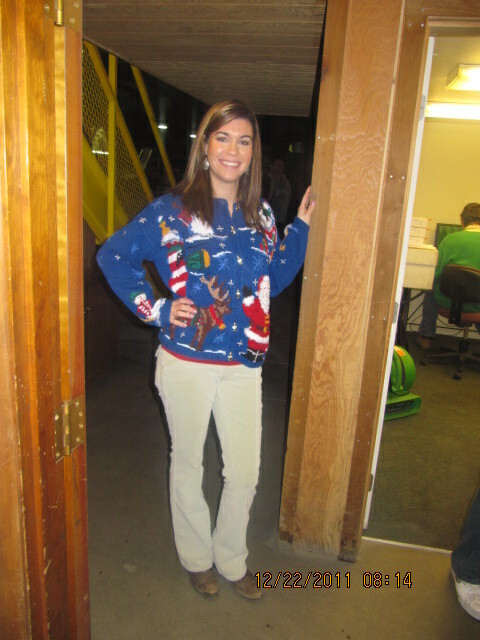 When it came to the ugly Christmas sweater contest, Necia brought the fabulousness (read: Christmas-y and hideous) to take home, erm, the top honors. All in all, it was a good time and everyone had a few laughs! Before we wrap things up (yes, that was a terrible Christmas pun! ), Bill, John, Tricia and Weston would like to extend the warmest of New Year wishes to our employees, our customers and the folks we do business with. We hope all of your Christmas wishes came true, and your family and friends will be healthy and happy in 2011. Thank you to all for helping Gold Dust grow into the business it is. Here’s to a great New Year! With Tables And Festive Table Cloths, It’s Lunch Time! Say, That Guy Looks A Lot Like Santa Claus . . . .
Whatever Weston Said, It Must Have Been Good! Now These Guys Look Ready To Eat! Plates Empty, Bellies Full . . . You Guys Want Seconds? 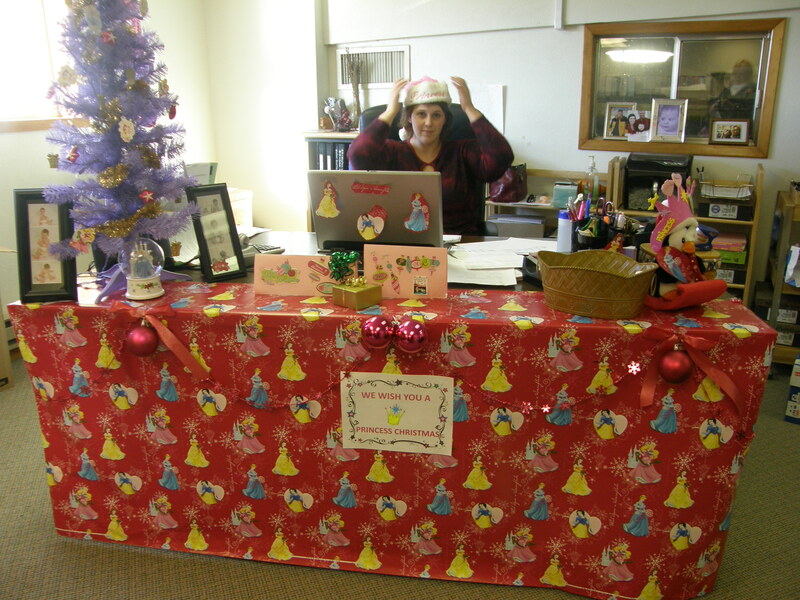 Tricia Is EXTREMELY Stoked About Her Tinkerbell Fairy Christmas Desk! 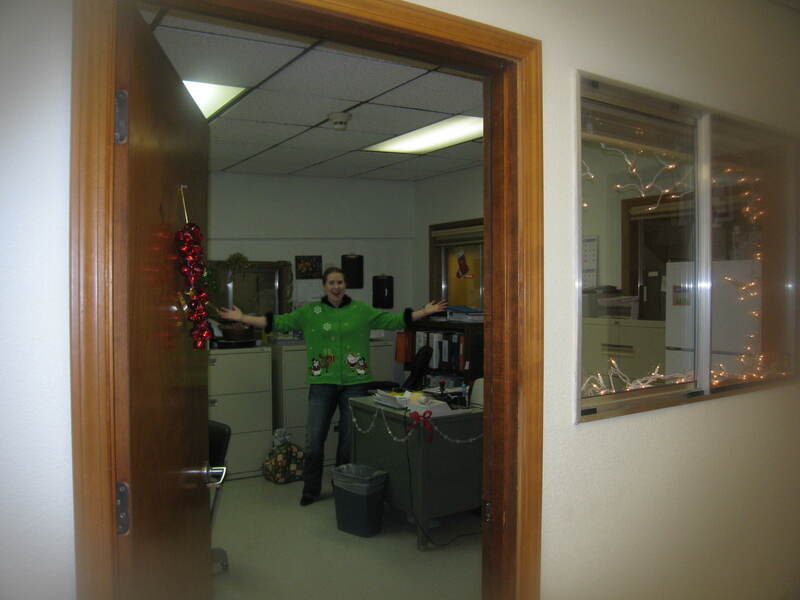 And This Picture Shows Only HALF Of Necia’s Office! As Necia Pointed Out, Andrea Does Have An Advantage With All The Company’s Christmas Cards. A Tree? Amber Was Bringin’ Her A-Game! Thanks to Lexi for the party pictures and Necia for the desk-decorating pics! Happy Holidays from Walker Brothers and Gold Dust! Merry Christmas and Happy New Year from Bill and the Walker Family! Now that Christmas has passed and we’re all bracing for the New Year, the folks at Gold Dust Potato Processors and Walker Brothers Farms hope your holidays were bright and merry and wish you a happy 2010. We would like to give our customers and our growers a special thank you and warm wishes as well for this holiday season. Here’s to a super 2010! Also, the Walker family in particular would like to thank our employees for the hard work they put in this year. Farming is never easy, and at times it can seem thankless. To the people who have recently joined our companies as well as the folks who have been with us for years, we appreciate all that you have done and continue to do for us. We see the dedication all of you have put into making this a thriving, growing business and hope 2010 is a successful year for all of us. Again, thank you very much! 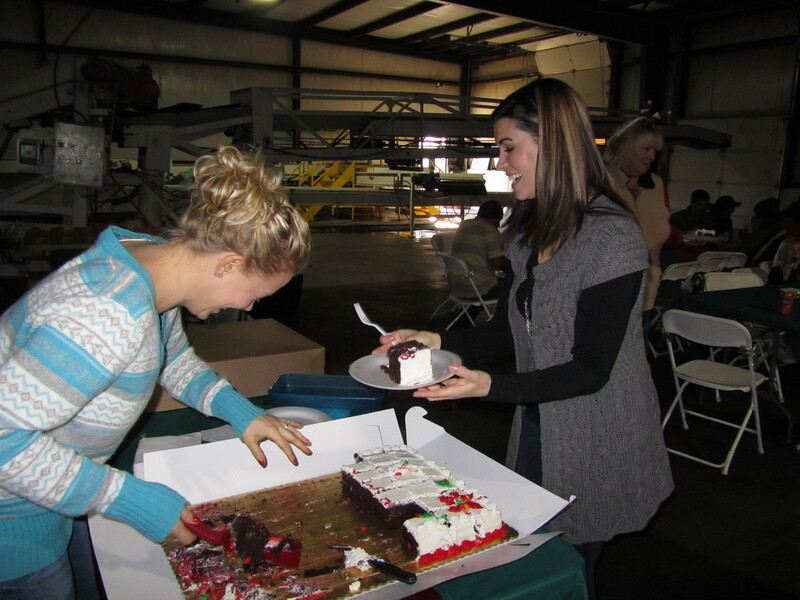 Since it is the holiday season, we also wanted to share a few pictures from our celebrations here at the shed. This year, we had a full catered lunch provided by Tacos Ala Mexicana (located in Merrill) for the office and shed crew on Tuesday, the 22nd. As usual, the food Tacos Ala Mexicana prepared was top notch and Bill applauded the Gold Dust employees for their attention to safety around the shed. Everyone had a wonderful time. 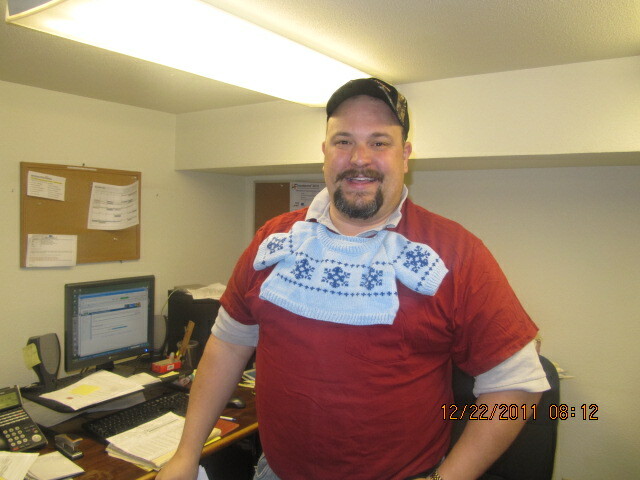 The following day, the 23rd, the office staff had a desk decorating contest, an ugly Christmas sweater contest and White Elephant Gift Exchange. Steve took home the award for Ugliest Christmas Sweater while Jessica and Tricia teamed up and took top honors for best decorated desk. For their efforts, Tricia, Jessica and Steve got their choice of candy or a toy from Brita. 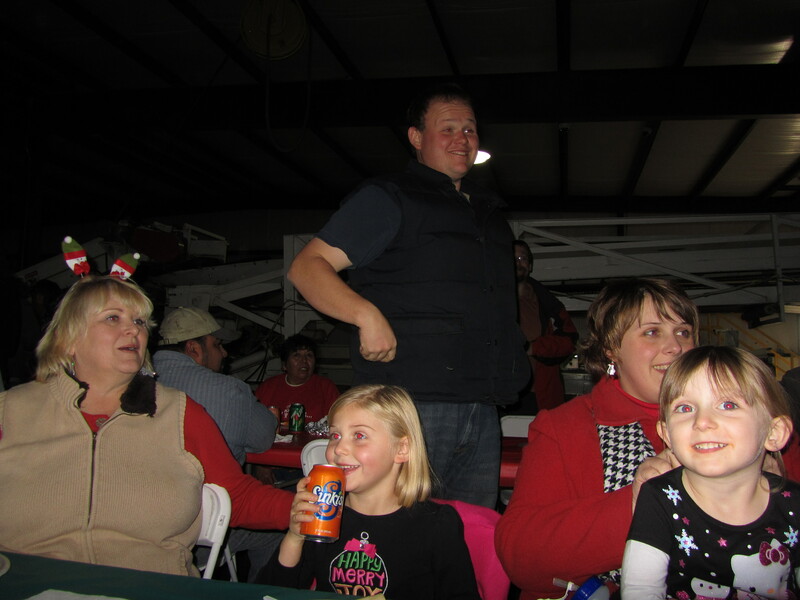 The contest and gift exchanges were a blast and put everyone in the Christmas spirit! We had a wonderful time celebrating the holidays this year and are looking forward to doing it again next year. Until then, here are a few pictures of our festivities! Steve, the Model of Christmas Elfness! Brita in Green with Snowflakes, Santa and Snowmen! 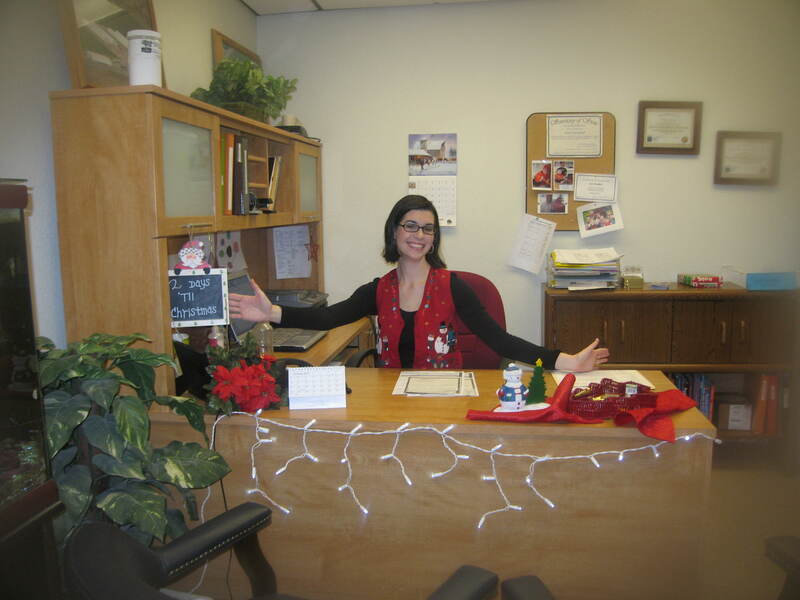 Alma Made the Front Desk Merry and Bright!